Time for the weekend again and for some of us, our attention turns to college football. Are you a sports fan? Possibly a football fan interested in college football? If so, you'll undoubtedly be watching the next few weeks as the top college football teams fight over who gets to play in a college football bowl game and which bowl games your team/s get to play in. UPDATE: I'VE PUT THE CONFIRMED BOWL LOCATIONS AND TEAMS ON THE SCHEDULE BELOW AS WELL AS THE MAP MASHUP. I've gathered as much information as possible on this and bring you the facts you need to know for the 2007-2008 college football bowls. How does the BCS system work? What teams have a chance to play in the bowls? When are the games? Where are the games? 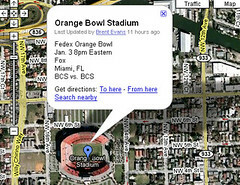 - check out the bowl game google map I created. Below is a college football bowl map I created with pinpoints for all of the bowl locations along with detailed information about each location, the teams that will play there (I'll update that once teams are officially selected) and the date & times for each game. Double click on the map to see more information and to zoom in to a certain location. For a quick listing of all of the bowl games check out the bowl schedule below. It is in reverse chronological order with the BCS championship game listed at top. I'll be filling in the teams once they are selected. Charlotte, NC ACC vs. Big East Wake Forest vs. Beyond the top two teams, the other eight teams come from a pool of league champions from the Atlantic Coast Conference, Big East, Big 12, Big Ten, Southeastern Conference and Pac-10, plus four at-large selections. The at-large teams must have nine wins and be ranked no lower than No. 14 in the final BCS standings. No more than two teams from the same conference can make a BCS bowl, and if the No. 3 BCS team is a member of an automatic qualifying conference but didn’t win its conference, it must be chosen for a BCS bowl. If the No. 1 team in the BCS title game is the champion of its conference, then that conference’s BCS bowl partner chooses first from the at-large pool, followed by the BCS bowl associated with the conference of the No. 2 team in the title game. The selection order for the rest of the bowls goes Orange, Fiesta and Sugar. HOW DOES BCS FORMULA WORK? The BCS formula has 3 rankings added together and averaged: the Harris Poll & USA Today coaches poll and the computer rankings. The computer rankings (six separate rankings withthe best and worst of those computer rankings being dropped from the calculation) do not consider the margin of victory and in most cases where the games are played.